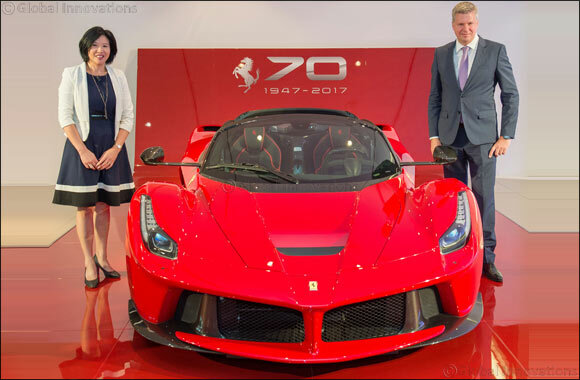 25th September 2017 Dubai: Al Tayer Motors, the official importer-dealer for Ferrari in the UAE, announced plans to celebrate the 70th anniversary of the legendary Italian brand. On September 29th, a number of Ferrari owners will gather at the recently opened Ferrari service centre within Al Tayer Motor’s largest multi-purpose facility, near the Dubai Police General Department of Traffic - Al Barsha branch. From the facility, they will travel in a motorcade to the high profile Jumeirah Beach Residence area and onwards to the Yas Viceroy Hotel in Abu Dhabi for a day of fun and leisure activities. The next day, 70 red Prancing Horse cars will form a giant number 70, with a height of 26 metres and total width of 96 metres at the Du Arena in Ferrari World Abu Dhabi for a unique photo-opportunity. They will then proceed to drive on the Yas Marina Circuit for a few celebratory laps. “We are truly proud of the incomparable heritage and history of our brand, founded by the great Enzo Ferrari, which continues to enthral Ferraristi worldwide even today and bring in more people into the Ferrari family. Our 70th anniversary is a great milestone for us and we look forward to the future with renewed hope and confidence in the company’s ability to produce cars that inspire the dreams of millions of people worldwide,” said Dieter Knechtel. Al Tayer Motors unveiled a LaFerrari Aperta on the occasion. Technological excellence, performance, style, exclusivity - these are Ferrari’s unique core values which are perfectly represented by the car launched to mark the 70th anniversary of the foundation of the company. Designed for Ferrari’s most passionate clients, the LaFerrari Aperta is the new limited-edition special series, an open-top version of the acclaimed LaFerrari supercar. Two special edition cars from the Tailor Made Collection developed by the brand in honour of the 70th anniversary were also unveiled - a 488 Spider and an F12 Berlinetta. Both cars are part of the 350 cars worldwide, which form the Ferrari 70th anniversary Limited Edition cars. Every car in the collection is a one-off car making them prized possessions for the owners. The 488 Spider 70th Anniversary car is inspired by the 250 Europa Vignale Coupe of 1953. The car has a Marrone Fer 800C colour exterior and a Creta C5 53 leather interior finished with Heritage Bordeaux leather seat panels with vertical piping on seat sides and on the panelling centre. The BICS roof of the car is in Vinnacia 666064 with the moving part of the tonneau cover in the same colour as the bodyshell. The car also has a rear matte black diffuser with matte black flaps, glossy black external grilles, glossy Argento Nurburgring wheels, matte black pexs and rear air ducts, external 70 anniversary badging and a Tailor Made 70 anniversary dedication plate. The F12 Berlinetta, in Bianco Italia colour on the exterior, is inspired by the 308 GTB from 1982. The interiors are finished Black leather upholstery with seats in Jeans Aunde Rosso. The livery on the front spoiler is in Blu Mariner with dreamline in Rosso Corsa and sidesills in Blu Mariner with dreamline in Rosso Corsa Blu Mariner. The car has an airbrushed shield, matte Black external grilles, Matte Gold wheels, an external 70 anniversary badge and dedication plate.